Do You Need to Use Peanut Oil to Deep Fry a Turkey? Traditionally, cooks use peanut oil to fry turkeys because of the flavor it adds, but you can use other common cooking oils. Whichever cooking oil you choose, make sure its smoke point is higher than the 375 degrees Fahrenheit you must maintain to fry the turkey. An oil’s smoke point is the temperature at which it begins to break down and create irritating smoke. The following are the smoke points for alternative cooking oils suitable for frying a turkey. Safflower and cottonseed oil smoke at 450 F. Canola oil smokes at 437 F. Soybean, peanut and corn oil smoke at 410 F. When you heat the oil for frying, monitor the temperature regularly to ensure it does not exceed its smoke point. The amount of oil you need depends on the sizes of your fryer and turkey. Typically, 4 gallons is sufficient for a 12-lb. turkey. 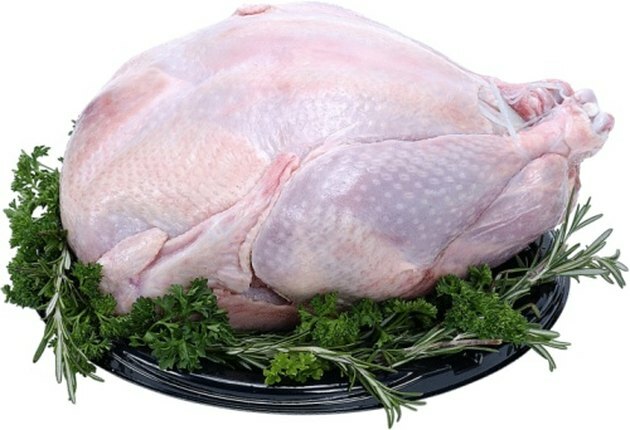 If you’re not sure how much oil to use, place your frozen, wrapped turkey into the empty frying pot. Fill the pot with cold water until it covers the turkey. Take out the turkey and note the water line. That’s how much oil you’ll need to use. Thaw your turkey thoroughly before frying. Frozen sections might burst due to the hot oil, creating a splash. If the splash contacts the open flame, you could start a fire. Lower the thawed turkey slowly into the cooking oil to prevent splashing. The relatively cool turkey will lower the temperature of the cooking oil, so you must raise the heat to get it back to 375 F. Allow the turkey to cook for 3 to 4 minutes per pound. The turkey is done when it reaches an internal temperature of 180 F.
If you’re cooking multiple turkeys, say for a large party, frying is a convenient option because it’s faster than using an oven. You can reuse most cooking oils until they begin to smoke at low temperatures. At that point, you must use new cooking oil. Note that you shouldn’t reuse oil if you burned the turkey. To store oil for later use, filter it through 100-percent cotton cheesecloth into its original container. Store it in a cool, dry place and use it within the manufacturer’s recommended time limit. Peanut oil typically lasts at least a month.